Very exciting news today, fellow beauty chicks! 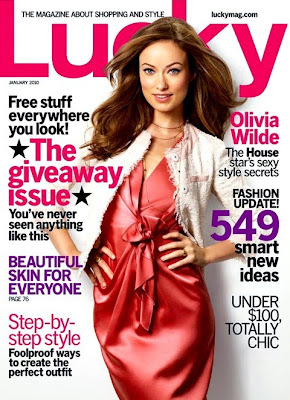 The amazingly talented manicurist and Minx specialist TracyLee Percival granted me an exclusive interview about the soft, simple nail look she created for Olivia Wilde's January 2010 Lucky cover. Here's the scoop on how TracyLee created the look. "Since the clothes had a lot of color, [Lucky] wanted something very natural," TracyLee told me. "They do a lot of very neutral nails." She started by reshaping Olivia's nails. "I made her oval -- she was a little square. But her nails were really short, so I wanted to make them look a little longer than what they were," she said. TracyLee then applied a coat of Orly Bonder Rubberized Basecoat. "I think Bonder is the best out there -- it helps the polish stay very well," she said. "I get longevity out of my nail polish, some people go for almost two weeks without a chip! I think that the Bonder is a big reason for that. A rubberized base coat is killer!" After applying the base coat, TracyLee applied one coat of Essie Mademoiselle and one coat of Essie Sheer Bliss. "I've been mixing colors for years," she told me. "I always like to see what will happen and get a different look than what everyone else has." TracyLee finished with a coat of Seche Vite Dry Fast Top Coat. "It dries fast, it helps with the chipping -- I like it a lot!" she said. "It's not too shiny where it's glare-y, because some top coats are like that. But I like the fact that it dries really fast naturally." To find out more about TracyLee Percival, visit tracyleepercival.com. You can also follow her on Twitter here. The January 2010 issue of Lucky is on newsstands December 8.